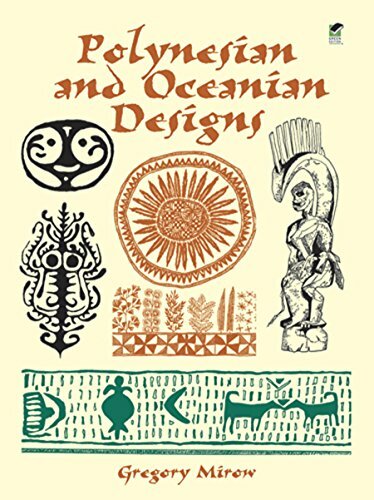 Here is a rich selection of original designs carefully adapted from authentic folk art of New Zealand, the Solomon Islands, New Guinea, the Hawaiian Islands, and Australia. It comprises 225 intricate images, derived from masks, wall tapestries, pictorial ornaments, sand paintings, pottery, carvings, wooden musical instruments, temple art, and other artifacts. This magnificent treasury features a wealth of original designs carefully adapted from authentic folk art of New Zealand, the Solomon Islands, New Guinea, Hawaii, Australia, and other locales comprising the Pacific island regions known as Polynesia and Oceania. Rendered with great detail and accuracy, the collection contains over 200 images drawn from the area's ancient tradition of decorative art: geometric patterns from tapa, the much-admired bark cloth; highly ornamented masks, canoe prows, and shields of Papua New Guinea; wood carvings from the Marquesas Islands; images of the mysterious giant statuary of Easter Island; Australian rock paintings; and much more. Additional sources include wall tapestries, pictorial ornaments, sand paintings, pottery, wooden musical instruments, temple art, and numerous other artifacts.